Wanted to post loads of art tonight, but failed. Too tired, and too much to do. *sigh*. Tomorrow night then. But today was still awesome (ok, the storyboard is not yet done, but still). Just got a whole bunch of books from the french bookstore in Montreal- ah bliss! The joy of reading in french again! Two Tezuka books, including one hardcover Black Jack with colored pages! Also Zipang and Death Note. That's for the mangas. In big european format, there is De Capes Et De Crocs- some of the best, wittiest writing in comics. Would love to share, but unless you do read french, a lot of its strenghts and beauty would be lost. mercurysblood Has done some amazing translation work, putting all the dialogue in Chinese! It looks really awesome-big round of applause and many thanks for taking the time to do so many pages. And foxysquid whom I may never have thanked properly for writing "Two Spirits", a fanfic set in the Water Tribe AU. I mean...to get an AU based on an AU, that is high praise indeed! After I read some Tezuka. Current Music:Going to bed, no music! Damn the French, they have the prettiest arts ;o;. If only all their books could be translated. I know there's a bit of SkyDoll and Blacksad out there at least, but that's just the tip of the iceberg. Well, De Capes et De Crocs couldn't be translated- you'd lose too much. I remember browsing thru the two titles you mentionned, but never quite hooking up at just the first glance. I'd need to sit down and pay more attention to them next time I can go and browse inside a french bookstore (May can't come fast enough!). Great job on the cover! I think it works very well, the red really pops out and there's a nice tension/anticipation. Plus, it pretty much summorizes this book. BUT your old idea had a very nice full body zhao portrait full page, and that series thing you had with all 4 covers showing him in the center, but in different clothes/situations. I like how that idea showed his developement through the series. But overall, I do prefer this cover though, the composition is excellent and it's nice to see some landscape in colour. Perhaps you can make the other covers match this theme, that would be awesome. oh and maybe portrait-zhao on the back? To make perfectly who this book's about? (Just random ideas hehe) Enjoy your new treasures! If I was going to make a cover for part two (which I may at some point- but that's not urgent so backburner! ), it would definitely be different. 3 and 4 would be slightly reworked. I was toying with the idea of putting him on the back cover...or just keep with the mostly blue-white theme and just a small something at the back with a short written teaser lines. I have a few days left to figure things out. I will never be finished! Mwahaha! The art in those french comics are really cool. Like, it's waving its arms at you! And the darkened part is a gaping mouth. I can't decide if it's going, "HI!!!" Or screaming in despair at its location, or doing a slow menacing wave with its tentacles. I think it wants to be taken home as a pet, but it's Zhao. And Zhao probably kicks puppies and stuff. Poor squid/octopus. I should go back to bed. Zhao definitely has no love for pets. He'd kick firenation squid all the time. (Now I want to do a version of this cover with a squid on it- wtf would it be doing there I don't know and I wouldn't care). Ha! I have just discovered and devoured Alim too - I love it to bits... It has also helped me understand better why your art, and Virginie Augustin's, is so lively: I think it's because you both have an animation background. Now I want to learn how to make my own stuff less static *g*. The art of Les aigles de Rome is as gorgeous as ever (I ♥ Marini), but the story didn't convince me. It's a rather big book, but nothing happens that really engages me, and I don't like the characters much. I'm waiting for part 2 to know where Marini is going with this. 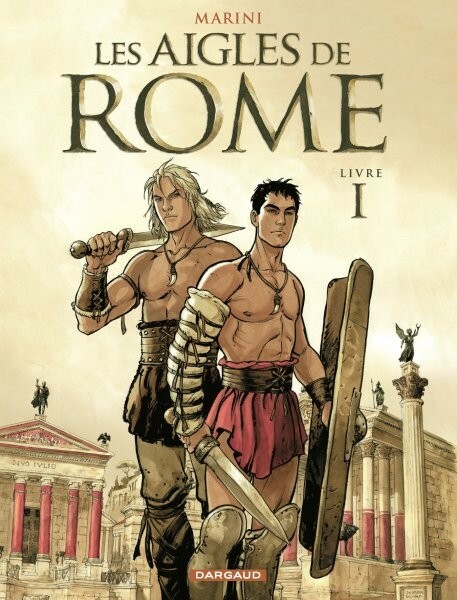 It interests me though, because the story of Arminius has a similar resonance in Germany as Ambiorix's (my own dream project) has in Belgium, and I want to see whether Marini pulls his retelling off as a story for today's readers. I have been eyeing De Caps et de Crocs for the pretty cover, but what's it like inside? 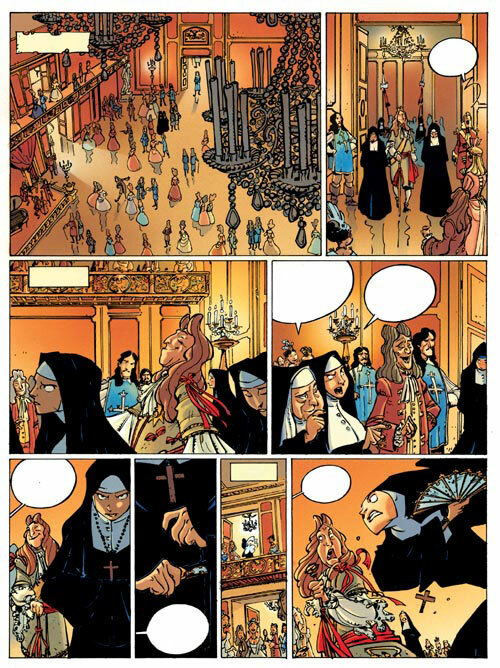 Another animation person who did a comic is Pierre Alary with Belladone - You may know it already. The story of the first book didn't completely grabbed me, and I never got the chance (or $$$) for the next ones. I'll have to remedy to that. I'm curious to read Les Aigles now- will see how the story grabs me or not. If not, there's always Scorpion left. Capes et de crocs is hit or miss with some readers, art wise. Sometimes rough around the edges, sometimes beautiful panels. But it is the mix of story, words and art that made me truly love that serie. Hey! Let me know what you think of Les Aigles De Rome! That looks like one I could enjoy! I'd get Scorpion first- will give you feedback on Les Aigles when I get to it. It will be after Capes et de Crocs, and Alim though. And that cover for De Capes Et De Crocs is absolutely gorgeous! My French is veeeery rusty...but would you mind posting a couple more samples? When you have time of course...you sound busier than I am, and I am BUSY. Black Jack is awesome! Plus, there were a few stories in the book I had never read before, so double sweet!! May be a bit too small to read, as are most examples found on the web I'm afraid. 8D !!!!!!!!!!!!!!!!!!!!!!!!!!!!! *hops around gleefully* there goes my dA page count. XD ...btw...this is Murielle. I tend to lurk when it comes to ljs. I am glad that you like the piece! 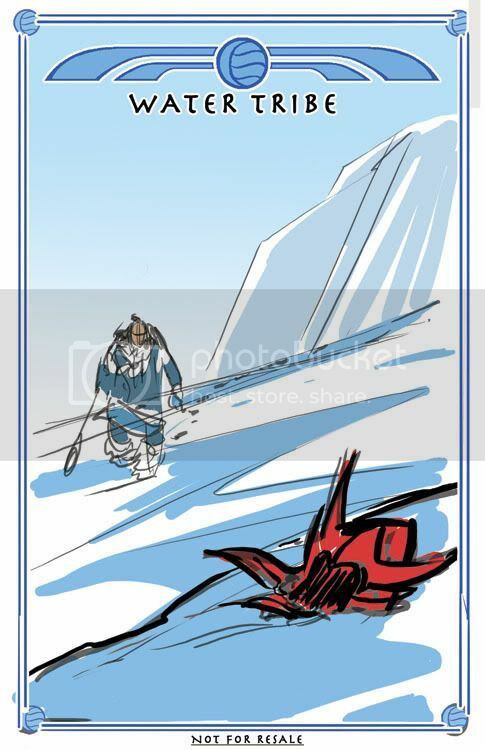 I kinda have to admit, your Water Tribe comic is what got me into Avatar more that anything else. Now I have half the family watching. Ha ha, I do hope it helps your page count- it's a nice piece. May it bring you more watchers for the rest of your gallery too. Cool idea for the cover. It has both a melancholy and a sinister air about it that just about suits Zhao's situation! Thank you- glad you like the direction the cover is taking. I wasn't too happy with a previous try. Thank you- and I've been honored that you took the time to write the story. I'm witing in Franglais in most of my emails to friends and family back in Quebec. Hopefully, a dose of french books will help a bit. En parlant de "De Capes et de Crocs", est-ce que tu connais "Garulfo", l'histoire d'un prince (arrogagnt) changé en grenouille et vice versa? 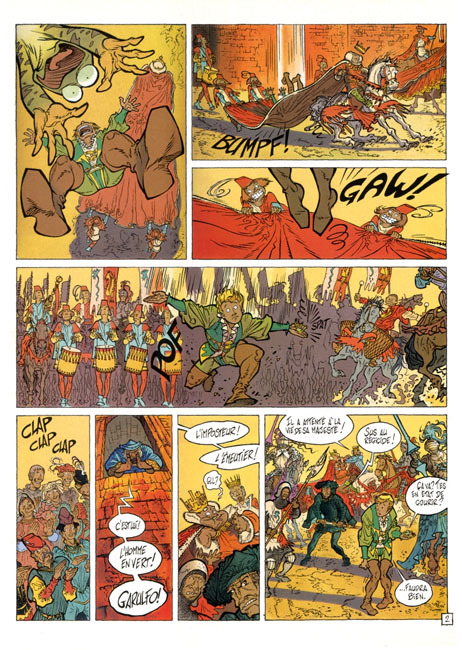 Et si tu n'as pas encore eu l'occasion de les lire, je me permets de te conseiller les BD de Manu Larcenet ("Le retour à la terre" et "Le combat ordinaire") et de Joann Sfar ("Le chat du rabbin" et son carnet de voyage "Maharadjah", par exemple). J'ai toute la collection de Garulfo! Une superbe série pleine d'humour, et définitivement une de mes préférés. Je me suis permis de feuilleter les livres de Sfar que tu as mentionné, surtout "Le Chat Du Rabbin". Mais je devais faire des choix $$$ et d'espace à l'apartement alors j'ai du passer. Et zut. Pour Manu Larcenet, je vais y jeter un coup d'oeil la prochaine fois que je vais dans une librairie francophone (en Mai, j'espère). Merci de la suggestion!